Konstantin Batygin was the winner of the Loren Steck Award during this year's Student Achievement Awards Ceremony. See story. Some of the greatest minds in the history of science have investigated the long-term stability of the solar system, including Newton, Laplace, and Poincare. The most recent contribution comes from an undergraduate at the University of California, Santa Cruz, whose calculations have shown how the regular orbits of the planets could go haywire at some point in the far distant future. The probability of this happening is small, however, and it can't happen for at least several hundred million years. "It's nothing to stay up at night and worry about," said Konstantin Batygin, who will graduate from UCSC in June with a bachelor's degree in astrophysics. Batygin got started on the project two years ago with the help of Gregory Laughlin, professor of astronomy and astrophysics at UCSC. Their findings will soon be published in a leading scientific periodical (the Astrophysical Journal) and have already been covered in popular magazines such as New Scientist and Sky & Telescope. "I had a good time working on this," Batygin said. "It's an honor just to be thinking about the same problem that was tackled by people like Newton and Laplace. Of course, I'm nowhere near those guys." Given his background, however, it is perhaps not surprising that Batygin is already making contributions to the field. The son of a physicist, he decided at the age of 8 that he would become a physicist himself. That was the same year his family moved from his native Russia to Japan, where his father worked at a Japanese research institute. Placed in a Japanese elementary school, Batygin spent the first few months not understanding a word that was said in the classroom. But he soon learned to speak Japanese. "We left Japan when I was in middle school, so I can only speak fluently about the kinds of things that mattered to me then. I can talk about Pokemon in Japanese, but not physics," he said. From Tokyo, his family moved to Morgan Hill, south of San Jose. Batygin said he knew he wanted to go to UCSC after his first visit to campus. "The campus is awesome, and it just felt like the right place for me," he said. 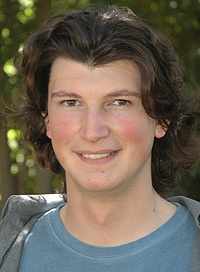 For his undergraduate research project, Batygin used computers to run numerical calculations of the planetary motions. Starting with the solar system in its current configuration, the computer can evolve the system for millions of years into the future. Beyond about 50 million years, however, it is impossible to predict exactly how the solar system will evolve. With the gravitational forces of so many planets interacting as they orbit the Sun, the system is inherently chaotic and unpredictable. "Poincaré showed in the late 1800s that even if there are just two planets orbiting a star, there is no perfect analytic solution for their orbits," Laughlin said. "That was the first indication of what became chaos theory and nonlinear dynamics." The slightest difference in the starting position of one planet can translate into enormously different configurations after millions of years, and it is impossible to measure the positions of the planets with enough precision to avoid that uncertainty. In order to explore the possible future trajectories for the solar system, Batygin and Laughlin used a technique developed by a French researcher, Jacques Laskar. Their results confirmed Laskar's finding that Mercury is particularly prone to eccentric behavior. In one of Batygin's experiments, Mercury veered into a collision course with Venus after about 861 million years. Mars also got into trouble and was ejected from the solar system in 822 million years. "If you wait long enough, the planets will eventually find themselves on crossing orbits, leading to close encounters, ejections, and collisions," Laughlin said. "This study gives an explicit demonstration and a mathematical explanation for what makes this happen. It's a very significant advance in a field that has interested astronomers and mathematicians for over 300 years." Unbeknownst to Batygin and Laughlin, however, Laskar had also been working on the same problem. Although he used a different method, he came up with essentially the same results and published them two weeks ahead of the UCSC researchers. So priority and the right to claim the discovery goes to Laskar, although the two studies provide complementary information and stronger evidence than either study by itself. "At least we know we solved it correctly," Batygin said. Batygin is currently working with Laughlin on another project, this one involving the search for planets around other stars far beyond our solar system. In the fall, he plans to begin graduate studies in planetary science at the California Institute of Technology in Pasadena.